We are coming up on the next presidential election this year and all of the political gridlock and drama has already begun to surface. I’m hopefully going to stick to my promise to the God and try and stay out of the political debates and hype as much as possible. After all, politics has done nothing but cause dissention, hate and divide this country in such a way that it is really quite sad. I believe that this division may be one of the very things that bring on the downfall of this country as I’m reminded of what Jesus Christ says in Matthew 12:24-26. Nowadays, I read blogs that are full of hateful comments and racist rants that make me think that we are back in the times of Jim Crowe. And I’m really sick and tired of the terms “liberal” and “conservative” because frankly, I no longer really know what they mean because their definitions seem much skewed. I call myself an “independent” because I will never put my faith in any political party ever again. So why am I asking whether or not God is a “conservative?” Well, I will be honest and say that it is a waste of time asking whether or not He is a “liberal” or Democrat because the answer is a no-brainer. Their overall agenda is called “progressive,” but as far as I’m concerned, they have only progressed into blurring the morality line, if not completely erasing it, when it comes to various issues. However, many of the so-called Christians in this country support the conservative agenda and label you a heathen if you don’t, no matter how holy your lifestyle might be. So just as black Americans are often accused of being brainwashed by the Democratic party, I submit to you that many Christians have drank the Kool-Aid of believing that the Republican party actually represents Jesus Christ. Therefore, I see the need to examine this ideology a little closer. A good friend of mind said it best: Republicans stand for righteousness and Democrats stand for social justice. I guess the better way to say this is that they at least appear to stand for those things. Well, I stand for both, so I don’t fit into either one. Scripture also supports that God stands for both because while He obviously hates sin, He also abhors oppression and dishonest scales, which are mentioned at least a couple of times in the book of Proverbs. It amazes me that the same people who are jumping up and down screaming about taking prayer out of school are the same folks who have an insatiable lust for capitalism. Don’t get me wrong because I am not necessarily anti-capitalism and I do believe that it is a travesty that prayer has been taken out of school. It just seems like I’m worshipping a different God than many of them because He clearly stated that we can’t serve two masters, according to Matthew 6:24. We will hate one and love the other. I have read and heard many people say that they believe that Jesus Christ would be a Republican if He were still on earth. Uhh… The Jesus I know and read about in the Gospels wasn’t a politician; He only personified the Truth of God. Politicians have to change with the times in order to satisfy their constituents and also end up compromising their belief system through bills and laws that are passed. Also, since when did Jesus Christ become a capitalist? Would He have considered anyone that is not rich, lazy and irresponsible? These are the common talking points of conservative talk radio and the attitudes of many of those who profess to have the love of Christ in them. They would have us believe that Jesus would have favored laws that benefit only the wealthy, which brings me to my next question: Was Jesus Christ an elitist? Would He have supported favoritism shown towards the rich over the poor? According to scripture, He didn’t even have a place to lay his head and traveled from city to city with his disciples. The things He spoke to the rich young ruler about selling all of His possessions and following Him says something quite different than the Jesus that this political party has tried to portray. Read Matthew 19:16-23 for the full account. While the conservative movement may have views on the issues of gay marriage and abortion that line up with the Word of God, does that really make someone a true believer in Christ? Well, I know that that crazy pastor from Arizona who called for his congregation to pray for the death of Barak Obama surely isn’t. (Google this story) There were also polls taken that indicated that a very large number of conservative politicians believe that President Obama is the anti-Christ. Absolutely insane! Obviously, these “Christians” don’t read the Bible, or are just as flat out lost as they claim everybody else to be. The same folks who talk about family and God are the same ones who I love the spoken word video by Jefferson Bethke that has now gone viral on YouTube (Why I hate Religion but Love Jesus) because there is a line in his poem that says “just because you call others blind, doesn’t mean that you have vision.” This is the TRUTH screaming loud and clear at all of us. I want to bring up this term “evangelical Christian,” which I hope nobody ever calls me. Why is it that this term always comes up in the midst of politics? I personally believe that this term has a political agenda attached to it (like The 700 Club), and it seems to refer only to a certain demographic of people. A few years ago someone emailed a prophecy to me spoken by Pat Robertson. Near the end of his prophetic word, he said that “they’ll embrace Socialism to ease their pain.” While I’m certainly not advocating Socialism, I don’t believe for a second that the Holy Spirit said that to him. This is the problem when politics involve PIMPING Jesus Christ in order to gain favor with certain groups of people! This is kind of similar to all the rhetoric I heard back during the previous presidential elections since 2000 that stated that “true” Christians would vote for George W. Bush. Again, God is not a politician! The conservative agenda has involved attaching their manmade political ideology to a pure and holy God! This is very dangerous and deceptive! While I fully understand that there are in fact true followers of Christ who happen to support the conservative movement, I believe we just need to understand that politics is simply that: politics. A manmade political ideology that did not come from God can never be righteous or holy. The gridlock we see in this country with biased reporting from the overwhelming majority of news networks has nothing to do with God. Well, I hate to bust your bubble, but the conservative movement is no different. It also uses isolated statistics and typical rhetoric to further its agenda. The idea that conservatism represents “Christianity” is one that I personally can never support because there are way too many contradictions from my vantage point. However, each one of us will have to make a choice of what to believe. The God I know doesn’t have a political party and never will. His Word will remain the same forever and ever. It was the third day of my journey to the holy land of Israel. We had visited a number of spots that day which included Megido and the place where the sermon of the beatitudes occurred. Early evening had set in and our bus had arrived to the city of Nazareth. Immediately, I was overtaken by the views of the architecture that adorned the sides of the mountains and hills. My camera flashed as I acted like the typical tourist. Little did I know, I was about to have my defining moment of the entire journey. 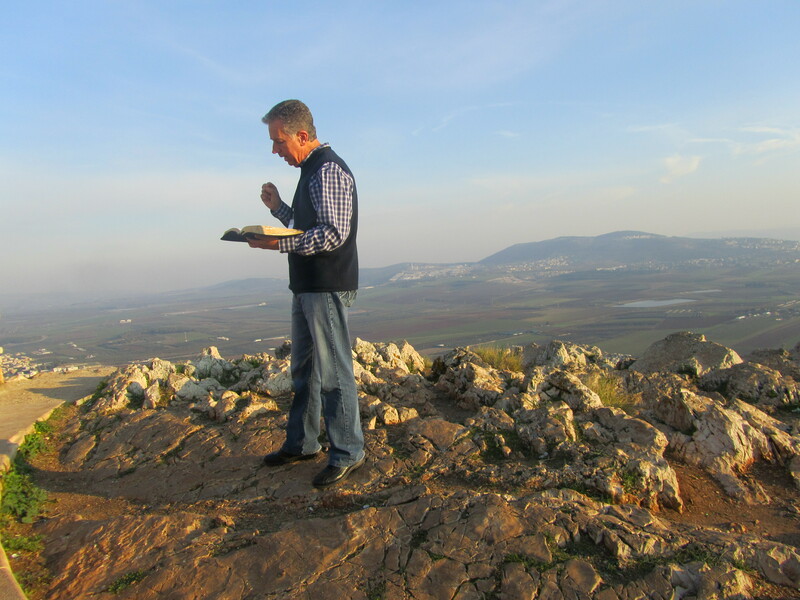 I had expected that my moment would come in the Garden of Gethsemane, or the Wailing Wall, or even the place where Jesus was crucified. But we can never predict when the Holy Spirit is going to move on us. This experience I believe is the Father’s heart cry to the body of Christ. Since returning from Israel, I have wrestled in my heart and mind about this issue. I realize that I have become so consumed with my future and my circumstances that I have lost intimacy with Him. I have misused the scripture in Proverbs about hope deferred as a reason to secretly remain resentful and bitter towards Him. Hence, I’m pushing Him off of that mountain. When I shut down, whether it’s by not giving my time to an outreach event or avoiding fellowship with other believers, once again I’m pushing Him off that mountain. When circumstances and desires for other things push me into complacency for the Kingdom, I’m shoving the One who died for me off of the mountain. So it’s no wonder that I’m unable to surrender the other areas of my life. But I’m so thankful that I can still hear His voice! Hallelujah! Some of the instructions I received as much as two, three even four years ago have begun to resurface, and I know this is Him giving me another chance. He is being so patient with me! No longer do I want to push Him off the mountain. I will never forget this experience and hope that it will be a constant reminder that true freedom comes only after complete and immediate obedience. It’s time to surrender all to Him and to stop quenching the spirit. I pray that you will do the same.